It isn’t often that we get to see a suspense thriller that dares to go that extra mile in pursuit of some novelty in a genre that invariable relies on clichés for effect. Vodka Diaries is high on pegs of pungent potshots taken at the suspense genre. It defies the ground-rules laid down by the architects of the suspense genre (whoever they might be) and deconstructs the entire edifice of intrigue into a cat-and-mouse chase which culminates in a frightening​crisis​. The film opens with an impressive severe topshot of a distraught K K menon running through the snow of what we soon come to know is Manali (a badge on a cop’s shoulder mentions ‘HP’). It’s a breathtaking shot and kudos to cinematographer Manish Chandra Bhatt. You suspect debutant director Kushal Shrivastava constructed the entire plot of suspicion and murder from this visually surcharged starting-point. Luckily for the debutant director, and for us, the narrative suffers from no serious starter’s hiccups. It gets involved in its own complexities without losing track of the myriad characters’ motivations. The very talented K K Menon takes a bit of time to settle into the wheels-within-wheels that run through the narrative in scampering motions. He tends to over-do the intense yet ironic interpolations of the character. This is a problem, since Menon is to be found in every frame, dominating the proceedings even when sharing awkward romantic moments with screen Mandira Bedi. But Menon soon settles down to a distraught destiny set aside for his character. Bedi, I might add, is an asset to any entertainment venue she is given to occupy. We just don’t see enough of her. Not even in this film where she has a limited screen occupancy. And she makes the best of it. But after K K Menon the actor with the best lines and moments is Sharib Hashmi. Last seen as the poor man’s padman in Phullu, Hashmi chews eagerly on every scene provided to him as Menon’s sidekick. Raima Sen, another beautiful and neglected actress, walks in and out of the proceedings as though shooting in bouts when on vacation. There are several such cameos in the plot. And I held my breath to see how the director Kushal Shrivastava and his writer Vaibhav Bajpai balance out the ostensible out-of-control plot about a cop who seem be losing control over the goings-on. Luckily the director never loses the plot as he manoeuvres the tricky suspense through a maze of deception and delusion, on to a bumpy but safe landing. 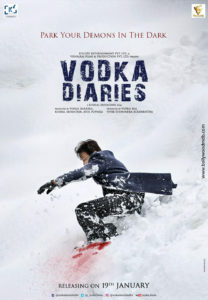 Vodka Diaries is not a great suspense drama when compared with the Hitchcockian tradition. God knows, the genre has not been much explored in Bollywood. Still in its infancy the whodunit gets a rather likable shake-up on this occasion. Vodka Diaries stays true to the path of deception and betrayal that the suspense genre adapts and makes some sharp swings into the unexpected towards the end. Do stay for the end-credits to hear Rekha Bhardwaj and Ustad Rashid Khan crooning Sakhi ri. It’s a sobering send-off to a suspenseful and original journey. 16 queries in 0.529 seconds.